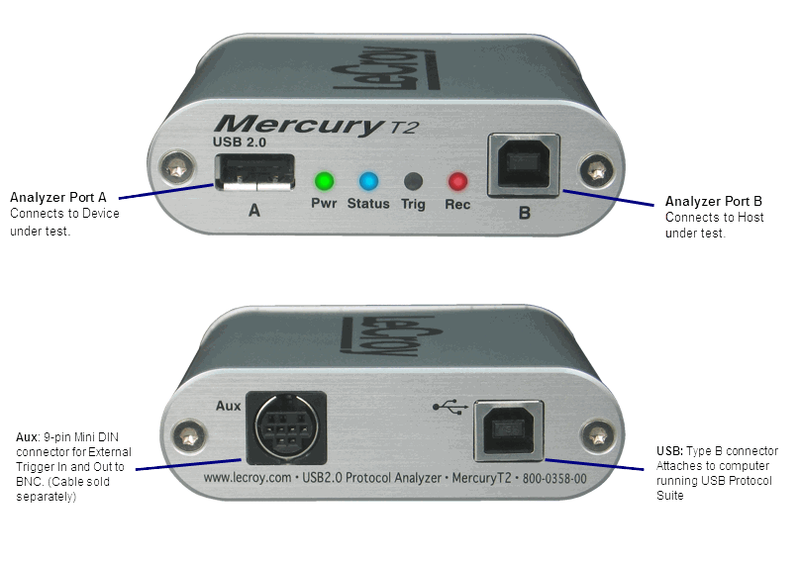 The Mercury T2 is the industry's smallest, most affordable hardware-based USB 2.0 protocol analyzer that combines the defacto standard CATC Trace display with powerful analysis features. The pocket-sized Mercury T2 is bus powered and is controlled using any Windows PC. With comprehensive triggering, the Mercury T2 provides much of the same lab quality protocol analysis capabilities offered in Teledyne LeCroy's top-of-the-line USB analyzers. Teledyne LeCroy has developed six generations of its industry leading USB protocol verification system since the introduction of USB in 1995. Each successive generation of the Teledyne LeCroy USB analyzer family has built upon the previous knowledge and expertise. Today, Teledyne LeCroy offers a broad range of USB test systems with unprecedented functionality, accuracy and user friendliness. The enormous cost of discovering problems after a product is released far outweighs the investment in Teledyne LeCroy's de-facto standard USB analysis tools. Their use improves the speed and efficiency of the debug, test and verification for USB semiconductor, device, and software vendors. Analyzers or bus "sniffers" also play an essential role in avoiding costly interoperability problems by allowing developers to verify compliance with the USB specification. Consistent with the growing popularity of digital media, the USB-IF announced USB 3.0 in late 2007 targeting 10X the current USB bandwidth by utilizing two additional high-speed differential pairs for "SuperSpeed" transfer mode. The USB 3.0 specification was released in late 2008 and commercial products began shipping in late 2009. Teledyne LeCroy has pioneered the development of verifications systems for this new technology. The only company that offers a complete line of USB 3.0 test solutions covering transmitter test to protocol test, and every step in between, Teledyne LeCroy helps developers achieve their goals of performance, quality, reliability and time-to-market for SuperSpeed technology. USB today provides a fast, bi-directional, low-cost, serial interface that offers easy connectivity to PCs. A hallmark for USB operation has been the ability for the host to automatically recognize devices as they are attached and install the appropriate drivers. With features such as backward compatibility with previous devices and hot "plug-ability", USB has become the de-facto standard interface for various consumer and PC peripheral devices. The USB standard allows up to 127 devices connected to a Host System. USB designates low, full, high-speed connectivity between devices compatible with the 2.0 specification. Most full speed devices include lower bandwidth mice, keyboards, printers, and joysticks. The use of high speed USB has exploded with the rapid growth in digital media in the consumer electronics market including media players, digital cameras, external storage and smart phones. SuperSpeed USB is designator for links operating at the 5 GHz frequency and compatible with the USB 3.0 specification. SuperSpeed USB provides a high performance connection topology for applications that utilize larger files or require higher bandwidth. SuperSpeed USB is backward compatible with USB 2.0, resulting in a seamless transition process for the end user. SuperSpeed USB offers a compelling opportunity for digital imaging and media device vendors to migrate their designs to higher performance USB 3.0 capable interface. NEC/Renesas was the first chip vendor to introduce host controllers for USB 3.0 (5/18/2009). The first motherboards featuring USB 3.0 ports from Asus and Gigabyte followed in late 2009. In the first half of 2010, dozens of SuperSpeed devices began shipping as vendors rushed to deliver solutions using the 5Gbps signaling speed of USB 3.0. Expect mass adoption into high-bandwidth applications in late 2010. As evidenced by USB popularity, several extensions of the technology have been introduced to try and capitalize on its installed base/ popularity. An example of this extension, which is supported and approved by the USB Implementers Forum (USB-IF), is USB On-The-Go (OTG). Designed to allow portable computing devices, such as cell phones and digital cameras, the ability to connect to other USB devices as either a host or peripheral, OTG promises improved interoperability for an enormous number of USB enabled devices. In addition, there are now dozens of USB device classes addressing everything from health care systems to isochronous video applications. Mass storage remains one of the most popular USB applications as consumers have embraced all types of digital media. The T10 committee has now finalized USB Attached SCSI (UAS) protocol which enables several significant improvements over legacy mass storage protocols including command queuing and streamed IO. Of particular interest is the new battery charging specification which provides a standard mechanism allowing devices to draw current in excess of the USB specification when connected to wall chargers or fast charging host controllers. In addition to the traditional data interchange application, the battery charging specification has solidified USB's dominant role as the interface of choice in the portable electronics market. The role of the host controller (plus software) is to provide a uniform view of IO systems for all applications software. For the USB IO subsystem in particular, the host manages the dynamic attach and detach of peripherals. It automatically performs the enumeration stage of device initialization which involves communicating with the peripheral to discover the identity of a device driver that it should load, if not already loaded. It also provides device descriptor information that drivers can use enable specific features on the device. Peripherals add functionality to the host system or may be standalone embedded operation. When operating as a USB device, peripherals act are slaves that obey a defined protocol. They must react to requests sent from the host. It's largely the role of PC software to manage device power without user interaction to minimize overall power consumption. The USB 3.0 specification redefines power management to occur at the hardware level with multiple power states designed to reduce power usage across the IO system. Comprehensive USB Device class decoding is included with the Mercury T2. This allows users to see upper-level mapped protocol events within the trace eliminating the tedious process of manually decoding device specific commands. From Mass Storage Class to Communication Device Class (CDC), the Mercury T2 provides the most complete decoding of USB device transactions. The Mobile T2 leads the industry in affordability with comprehensive USB 2.0 test and analysis features. Starting at $875, the Mercury T2 can be used virtually anywhere, extending beyond the lab environment over to the personal workstations of USB developers. Every engineer within a design team (hardware, software, and firmware) will appreciate the benefit of having a personal analyzer to fit their individual needs. Featuring the industry-leading CATC Trace expert analysis software, the Mercury T2 system provides an easy-to-use display that graphically decodes logical protocol events. With the Standard or Advanced edition, all protocol levels can be expanded to show the underlying transactions and packets. Completely passive in design, the Mercury T2 preserves real-world signaling and provides 100% faithful representation of traffic on the bus. Featuring a high-impedance, non-intrusive probe, the Mercury acts strictly as a "sniffer" and does not re-time or affect signal amplitude between the host and device. 256MB of physical data recording memory can be extended with filtering and data truncation. Isolating specific protocol events with real time triggering is essential to capture intermittent problems. 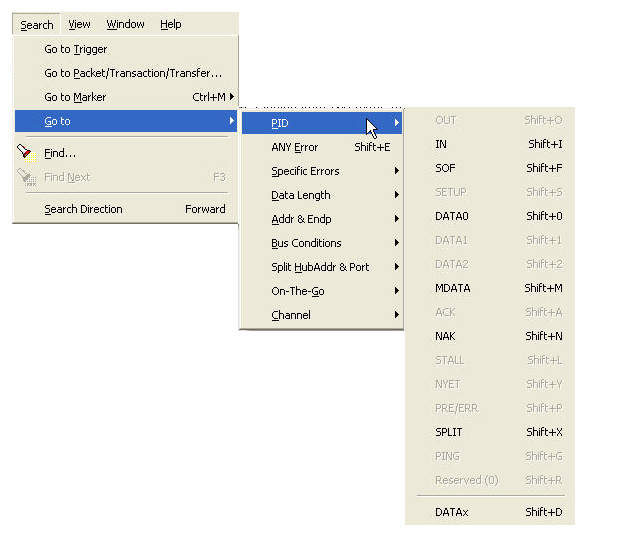 The Mercury T2 provides sophisticated triggering with drag-and-drop selections for PID type, data patterns, standard requests, errors, and bus events. The Mercury provides 14 protocol error triggers with auto-detection of several additional post-capture errors. 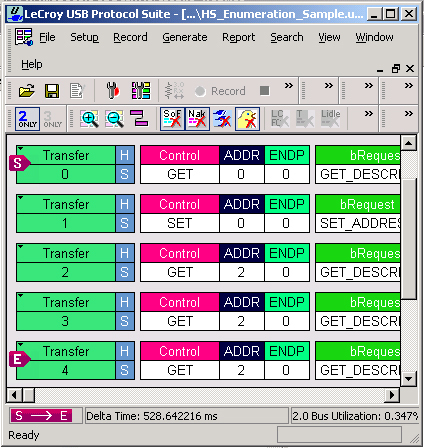 The ability to trigger & pinpoint specific bus conditions as they occur saves time during testing and debug. The CATC trace software includes a persistent timing display that provides one-click measurements between events. The bandwidth calculator provides full bus utilization metrics for any range of packets. 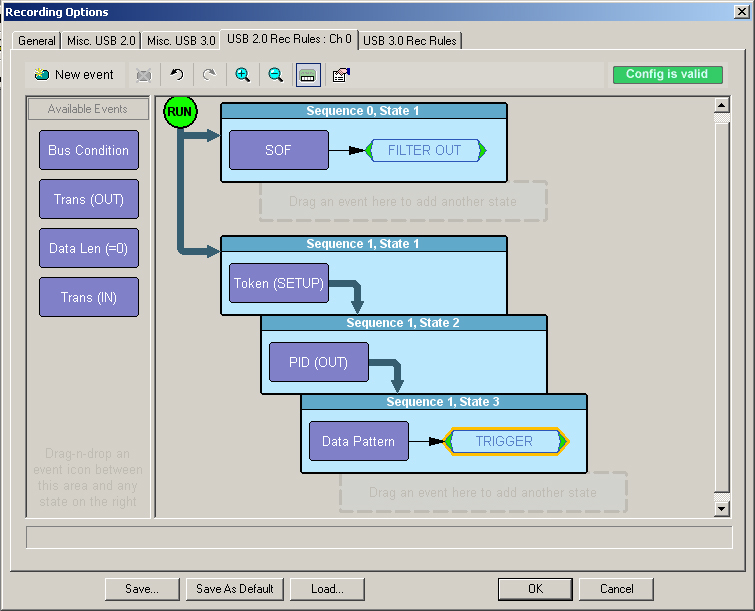 Teledyne LeCroy's USB software provides many mechanisms to measure and report on USB traffic. The Bus Utilization graphs data, packet length, and bus usage by device. Using the Traffic Summary window, users can evaluate statistical reports at a glance or navigate to individual packets. Powerful search and reporting options allow users to quickly navigate to specific packets, errors and any data type within a trace file. The CATC Trace also supports filter and hide commands, to remove irrelevant data from the Trace for efficient viewing.